This big old Lincoln at one time was a huge luxury car. I say at one time because one time is long forgotten. But to give you a short history lesson people back in the day bought Lincolns and Cadillacs to ride in luxury. You were special, you had more money, and the ride was quiet and smooth. Much has changed over the years as did the Lincoln and the Caddy. Today, they are smaller but still retain the luxury angle. But the owner of this Lincoln went out of the lines. There is nothing shown here that reminds me of a huge slow luxury machine. 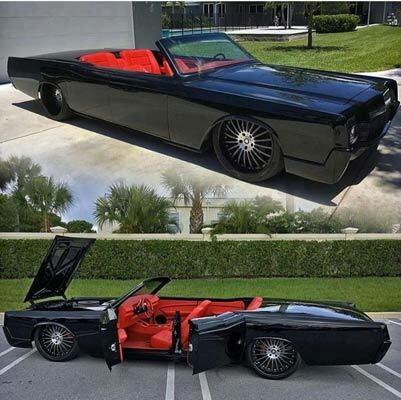 This huge Lincoln was transformed into a low rider hot rod. The deep black exterior and the bright red interior sticks out like a cat at a fish store. Jiminy Crickets this car is so cool. I will lay odds it still rides nice and is a great low rider. Parking this land yacht may be a trick as you may need a flag man to assist. But, this car will excite your bones and senses. Not every fast muscle car needs to be Camaro small and 396 fast. All hot rods can make the tour. This hot rod just has room for a family of eight. And, that is enough. Get it? Related ItemsConsider An old Lincoln?